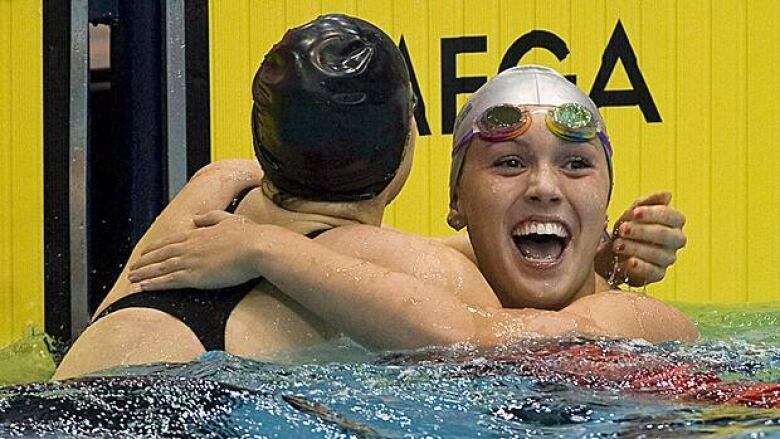 The record-breaking swimmer talks about staying positive at the Paralympic Games. Summer Mortimer has developed a new method of boosting herself at the London Paralympic Games. When she feels a negative thought coming on, she snaps the elastic band on her wrist. It's a method recommended to her by Craig McCord, the coach of Team Canada's para-swim team. And the 19-year-old medal contender from Ancaster has put it to good use. World record holder in the 50 freestyle, 100 freestyle, 50 backstroke, 100 backstroke and 200 backstroke. Four gold medals at the 2010 International Paralympic Committee Swimming World Championships. "I'm incredibly hard on myself with everything I do," Mortimer said in a phone interview with CBC Hamilton from the Paralympic Village in London this week. With the elastic band trick, "you realize how often you think down. It's really allowed me over the last week to change my mental perspective on things." Mortimer has plenty of reasons to feel optimistic. The athlete landed in London for the Paralympic Games on Aug. 23. Between now and Sept. 7, Mortimer will compete in six races — the 50 and 100-metre free, and the 100-metre backstroke (she holds world records in all three, as well as the 50-metre and 200-metre backstroke), in addition to the 200-metre individual medley and two relay races. The Paralympic Games start on Aug. 29. Mortimer's first race is Aug. 30. The Games are the latest stop in a long road for Mortimer. Born into a family of swimmers — including her parents Craig and Janice — she began swimming at age two. She started swimming competitively at age nine. In 2008, she participated as an able-bodied swimmer in the Beijing Olympic trials. Then things changed. Also a trampoline athlete, she was practicing on Nov. 27 when she landed feet first on concrete, shattering most of the bones in her feet. With her mobility limited, she used a wheelchair. Doctors considered amputating her feet. But Mortimer fought back, going from crutches to walking despite the agonizing pain. Her vigorous training has led her to medal contention at this year's Paralympic Games. Mortimer is staying in the Canada House portion of the Olympic Village. Her days consist of eating, sleeping and swimming, she said. There are nerves, and occasional negative thoughts she treats with a snap of the elastic band. But ultimately, she knows she has done all she can. "All the work has been done," she said. "All the training and the hard work has led up to this point, all the stress and ups and downs and the pain." Realizing that, "the nerves are dying down," said the Westmount Secondary School grad. The other athletes are inspirational, she said. Many have overcome tremendous obstacles to reach their level of athleticism. As for Mortimer, the number of people who have helped her train is at the front of her mind. That includes her parents, who left for London on Monday to come cheer for her. Mortimer is relishing her time in the athlete village, where there is a steady flow of food and recreation, with pool tables, game consoles, a massage therapist and a beauty salon. "It's like the whole world is within a couple of blocks," she said. Ultimately, Mortimer hopes to stay positive, which is getting increasingly easy as her first race day nears. "I'm so grateful for the experience, and I really want to show my gratitude by bringing home a medal for Canada," she said. "I am here because I'm part of my country."